Connect with co-workers, challenge other teams, and spark some nine-to-five fun. When you start a fundraiser at work, you pretty much have a built-in network of donors and participants — and helpful support too! And if your company matches donations, even better! Create a “Heart Wall” by selling Paper Hearts! Collect Spare Change …it’s amazing how much gets donated! Organize a Scavenger Hunt! Ask for a minimum donation to play. We had a blast during our team-building scavenger hunt fundraiser for the Heart and Stroke Foundation! Every nine minutes a Canadian has a stroke. 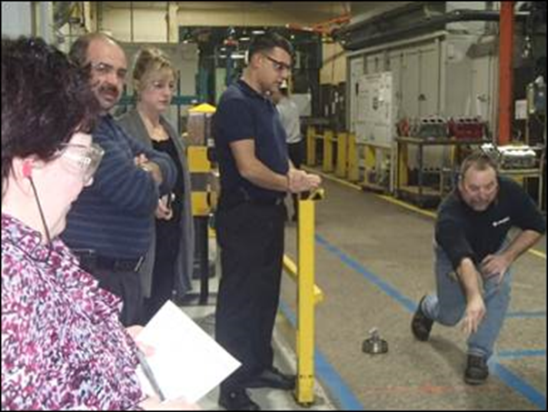 Comtech employees threw likenesses of curling stones they made on their shop floor!